We are now the 3rd largest stock broker in India in terms of active clients. Thank you for helping us achieve this in just under 8 years. I also want to thank the exchanges, especially NSE, for the NOW platform that was launched almost a decade ago, that helped kick-start our business. Not to mention, SEBI, for bringing in regulations that have ensured lower leverages/risk in the industry allowing a level playing field for all to compete with established businesses. We pioneered the discount broking model in India and are fortunate to have been able to scale it. Our growth and success is a testament to the viability and efficacy of our model and the integrity with which we conduct business. Not to mention, the recognition we’ve received over the years for our efforts. Contribute upwards of 8% of all retail trading volumes across exchanges. Do upwards of 2 million retail trades daily, which would put us amongst the most active retail brokers globally. Are in the top 20 investing related websites in the world. We have over Rs 300 crores of our own capital in the business. We run a rewarding employee stock option program to ensure everyone working is also a stake holder. Have invested in 8 different fintech startups through our incubator, Rainmatter, with the goal of expanding participation and bringing about innovation in the Indian markets. Having said that, it has come to my attention that there are unscrupulous parties spreading rumours about our business on social media and other forums. I have put together a bunch of reasons on TradingQ&A on why safety shouldn’t be a concern when trading with us, should anyone be curious. With our innovative technology and platforms, educational initiatives, and the Rainmatter startup partnerships, we are giving a shot at bringing in the next 10 million Indians to the capital markets. Like we always have, we continue to seek your support. Nithin Sir, Zerodha has been nothing short of a boon to me as a retail trade. I really admire what you are doing to increase the retail participation in India and speaks volumes about the intent you guys have. I hope Karthik sir is reading this and I am blown away by the what he is doing with Varsity. Keep doing what you guys are doing. All the best! Zerodha Pi, Kite, coin, small case and more Products will help India People to gain their part of EQ. Hope this Products reach to Villages and Remote Places…! Many Congratulations. Ina year or two, our Zerodha will be the Largest stock broker in India. A small request, can you increase Font size or make it Bold on Kite, so that it will be visible easily. Congratulations Team Zerodha. Waiting to see in top. I believe India bulls will also fall in top 3 place of top broker with maximum active users. Hello Shree Nitinji good evening n ? congratulations.You n your team surely deserve this appreciation and acknowledgement too. I feel proud to be part of this success and expected many more such accolades in coming future. Great job done. keep it up, good going.. Still long way to go. The basic Mutual fund service is not available for NRI customers. As of now only assurance is given to NRI customers that SOON we will start MF service (Zerodha Coin) for NRI customers. I request Zerodha management to get this Zerodha Coin service for NRI ASAP. Kudos to Zerodha Team for achieving this feat ,wishing you many mores such feats to come. We are glad to learn that many users of our Call Put Analyzer App(Android) are successfully using the Zerodha trading platform. The feedback received from them is that the strategies which are generated at Call Put Analyzer App(Android) are best executed at Zerodha trading platform. Thank you for providing such wonderful products to the customers. There is. It’s called a BO/Bracket Order. Indeed Zerodha has been a pioneer to provide tech based deep discount trading services. I have actively traded on Zerodha over 9 months and I find the overall experience as good except one thing. That is, Pi. 1) It hangs every 10 to 20 min and then it has to be restarted, leading to time waste and inconvenience. I am using latest pc and high speed internet connection, so as to rule out the possibility of my pc or internet being the reason for hanging of pi. 2) On papers, it supports 5 market watch tabs upto 250 scrips, but in reality, more than one market watch and with over 50 scrips, the market watch doesn’t work properly at all. When it is started, it shows incorrect data in the form of NA and zeros against many scrips of the market watch. Every time I have to manually load the market watch from the saved work space, again leading to time waste and inconvenience. And then it hangs after some time and leaves me furious and disappointed. 3) The above 2 issues have been coming from last 6 to 7 months. Before the pi update of Nov/Dec 2017, it used to work all right. It used to hang once in a while and that was acceptable. But after the Nov/ Dec update of pi, pi became bad and it would hang every 1 to 2 hrs. But after the recent pi update last month, pi has become become total crap, because it now hangs every 10 to 20 min. The issue of incorrect market watch data as mentioned in point 2 above, has been as bad in the recent update as it was after the earlier pi update of Nov/Dec. 4) Zerodha overall support is good but the technical support is pathetic. I have escalated my trouble with pi many times over tel /email / web complaint along with many screenshots of the trouble but they are not able to solve the issue. They connected to my pc remotely, checked all the settings, configured the pi themselves remotely etc etc but still the problem could not be fixed. I think they employ very low skilled tech ppl who cant think of any solution beyond …..”clear the cache and reinstall pi and it will work fine”. I don’t know if any senior management personnel of zerodha gets to read my post and if he does, I hope he will do something to fix the issue of pathetic pi. Great going Nithin and Team Zerodha. All the very best for the future. This is so cool, I hope to see you in the Top 1 position by this FY. I always admire by Zerodha becoz you guys intend to educate the clients by giving the proper information through Varsity, &Trading Q&A and others broker may copy your pricing system but they can’t provide a better service like you guys!! Best of luck for your future ahead !! Congrats zerodha team n Nitin. I will say, it is just the beginning. We will see it brighter if it stay tune as it is now. Hope zerodha is prepared for the huge incremental clients to fulfill at least basic values. All the best. nithin sir, u are a god to traders like me. Grately appreciate all new things you do. kite3 you have built is amazing. You are a genius sir. all the best to Zeroda. congratz. With the percent jump shown, there is every chance to reach at top in the next annual report! I hope 3 does not mean 16th place at Zerodha. Indeed the stability of Kite 3.0 remains questionable, there is lot of stability which needs to be brought in. Hoping that a CEO does not make fool of the people replying in dark. Here everyone is in race it’s fine being competitive ,But I’m in the competition to see Indians invest in share market . At first I suspected to join in and with a doubt I innetialli invested a small and knew the facts by studying contract notes then recommended to many. Thanks a lot for the discount broking. Please open your eyes and mind and try to admire people for their achievements. I am a new member to Zerodha platform but I am very satisfied what they are doing. Please don’t confuse people with wrong information. Read this somewhere today morning. Congratulations!! Being customer centric pays and this is the proof. Zerodha Becomes the Leader of Brokerage Industry (Grows 200% in FY2018)- Nothing can stop a Business when its customers love it. Every Problem is a Opportunity (High Brokerage). FY2018 Estimated Profits Zerodha – 161 Cr. Motilal Oswal – 155 Cr. Edelweiss – 140 Cr. Great going. Happy with that. Congratulations to Zerodha Team. The No.1 place is not too far for u guys now. Congratulation!! Zerodha done a exceptionally good job stock broking industry.Keep it up. Congratulations Zerodha Team !!! Keep rocking and move forward. Congratulations Nithin to all your hard work and Team Zerodha. Hope to see you guys at No. 1 before the end of 2018.
congratulations well done in india zerodha has provided technology to trading.. I stopped trading in 2012 as I felt it was too complex to observe and execute trades. After Zerodha/ Kite, it made it look so simple that I had started it again from 2016 and everything is in my control at tip of my fingers. Congratulations Nithin & Team Zerodha. Congrats to you Nithin and your team for providing this great platform that adds value to clients at very low cost. Hence, #3 position is not surprising and I’m sure one day Zerodha will be #1. All the very best. You deserve the top rank. I wish Zerodha become India’s number 1 stock broking company soon. Hats off to you !! All the very best for the future.Congratulations! Congratulations.. Let’s grow and make wealth together. Addition of upi for fund transfer is good move. I like this platform more than others fast, easy, powerful to trade. congratulation team zerodha their are lots more to come in near future…. Nithin, You are a person of inspiration to me.It is great that you brought upi transfer to trading account. Congratulations Nithin. These are the fruits of you and your team`s hard work. I always admire you guys for your tremendous improvement and support. Hop soon u will be on top. Congratulations and Keep growing your business. Wish you to be on number 1. You have changed the way people think about trading. Now focus on stability and quality and other features which we dont have and others have it. Congrats! Zerodha team. You guys doing great job. Thanks for giving such platform to trade us. Congratulation to Zerodha Team and good luck for future. congratulations and wish you many more success to come in future. Congratulations! Keep up the good work! Best Wishes! Really enjoy being here though!! Congratulations to ZERODHA team. Keep going and expand with advisory services tooo. ? All the best.. your platform is the best by a distance. Congratulations!! Zerodha and Nithin Sir!! Great going. I am proud of to be part of ZERODHA. You are the first largest broker under Discounted Brokerage category. keep it up and try to give margin for delivery. Congratulations Nitin and Team Zerodha. Keep doing the great things and will sure reach to top position in coming years. Great Going. Our best wishes with you..
hope it will be 1st next year.. I am proud to be a part of zerodha. Today was the first day i thought to use zerodha( i am currently using icici direct ), i transferred 1000 rs. to give a try and it reflected in my zerodha account instantly but when went ahead with the withdrawl option, it was showing zero account value under the ‘funds’ tab. Though i have contacted your support team and they ensured that the issue will be resolved but i request you to kindly ensure that this doesn’t happen again. When you transfer funds, we only receive the funds on T+1, which is when you can withdraw them. I transferred the funds yesterday at night , ok so as per your suggestion i’ll be waiting till tomorrow morning to see if i could withdraw funds. Good Platform for the new investors and customer follow up is very excellent. Happy to be a part of Zerodha. Nithin ji, all your platforms are very good and useful . but regarding opentrade make it more useful to traders. Improve that platform which is lacking behind when compared to other platforms of yours. Great!! Am New to Zerodha. Few suggestions…bring ALGO in android, make Kite App in android more informative, add short and long-term investment tips in the app…like IIFL does. Great to hear that you guys are now in top 3. # Profit and Loss reporting is not accurate. Your customer care team told me that this will take around 7 days. Though no prior notification or information gave to us regarding such up gradation through email or sms or even on our dashboard. I live zerodha spirit…. I follow Mr Kamat. He is a inspirational soul. I have been rejected 2 times by zerodha for a job vacancy give me a chance to work in zerodha I will work hard to bring it to no 1 position one chance one job for a working hand ?? Congratulations! wish you the top spot at the earliest. Thanks for your discount broking model which prompted me to shift to your platform from my earlier broking firm. I am satisfied with the trading Zrodha. All the best to you all at Zerodha. Congratulations to Nithin Kamath and whole of past and present Zerodha Team for making it happen. I have been your customer for last five years when you were in initial stage of formation. While opening the account with you I had some hesitation as to how to part my money sitting in Mumbai and having a small brokerage having its demat facility through IL&FS dealing from Bangalore. But since day one of my I have found whole of your Team to be proactive. Congrats once again and keep it up awaiting for more user friendly services you have been providing all this years. User Id : RA0090 (Active) and DI0005 (since closed for personal reasons). Post your PWD as well mate!! Amazing work guys, and thanks a ton. Forward and upward! I would like to congratulate zerodha for this great achievement and it may be possible that gain no. one position in coming year by it’ s service. superb Nithin sir…wish to see number one spot in the coming years….all the best. Congratulation Zerodha and all team ……!!! So time for your ipo? All the best nithin sir and zerodha team ??? you have a very good software, ease to use, & having good chart’s studies, further good customer/sales support which solve queries at lightning speed, compared to other brokers, this was bound happen. please maintain these standards, & all the best for future! Great going Nithin and Team Zerodha. My association with Zerodha since last 3 years.It is proud moment for all Zerodha members for rating Zerodha as 3rd largest share broking firm. Request two things from you Nitin. 1. in CO we should be able to set a target price against trigger price in Kyte MCX. 2. you should facilitate any changes in personal data by uploading documents in your site. like nomination,Bank Accts ,Address etc. Congratulations, kite3.0 is better but can this be revised so as to accommodate indicators of client choice? Heartiest Congratulations !! Well deserved. Excellent work by Karthik and team for putting varsity together. It is a boon for starters. Your zero brokerage for delivery has made swing trading a breeze for me. Congratulations, Keep up the good work. I feel you are providing premium quality to its customers as well. You are doing great job & giving best service. Next year, we will see you at No 1. Congratulations for this achievement ? wish to see more fruitful Ideas from zerodha team in near future. I can say lot about Zerodha improvement in the trading platform like Chart with different technical, User friendly interface, Quotes identify etc. But finally I can say, I’m proud to be Zerodha account holder. Keep improving the platform. Considering all these, I have refereed 7 members and all of them opened account and using this platform for their financial investments. many congratulations to zerodha , be the 1 st in india with no doubt. Why RKSV (Upstox) name is missing in the list. This list just has the names of the top 19 brokers by the number of active clients, Jay. Good service & very easy to use the platform.congrats team zerodha. Congratulations… Keep it up guyzzz.. Congratulations!!! keep the momentum upward to reach no 1 position. All the best. Congratulations and thank you for all that your team has done for new traders like me, love varsity and everything else at zerodha, sometimes there are few technical problems but I m sure zerodha will fix it in coming months, keep up d good work!! Congratulation Zerodha Team !!! Hope to see more successful stories together. Congratulation Zerodha and all team. All the best team of Zerodha. I hope be the Zerodha No.1 position in very soon of coming year. congrats Nitin .keep working hard I want to see zerodha #@1 .it also feels me great as I opened account with you in 2011. It feels the joy of finding of a multibagger stock at the beginning . all your tools are awesome specially coin. GOD bless u and your family , go ahead. Congratulation Team Zerodha. Kite will go higher and higher in the sky. Awesome blend of technology and functionality. Thumbs Up Zerodha ! Three Cheers for the third place !!! Very soon it is going to be Numero Uno . Congratulations to Shri Nithin Kamath ji and his enterprising team. You have got a fantastic User Interface. Word of mouth must have helped you great. I recommended Zerodha to at-least 20 friends are they all are happy user. Got 1-2 suggestions as well. will post in some other forum. Thanks to Karthik’s Varsity for educating us. Keep doing great work! Congratulations for the stupendous growth in a very short time. Congrats for these success..and you may continue to do so for long-term..as firstly i like your websites user interface very much…secondly it is very easy…one thing I expect from you is a short analysis of company (i.e. financial info year wise , other financial ratio , cash flow , price chart , etc) . You may publish videos for benefit of long term investing. I am just telling ki your interface is good. kindly go ahead for some other value additions service for clients to grow business multiple times. It is really worth amd pleasure to do business with you. I am never changing my broker. ? Congratulations, It’s now time for the party. Have a bright future ahead. Congratulations sir love u so much?? keep it up. My heartiest congratulations on achieving the 3rd position in the brokerage within a span of 8 years.. Hope the next target of reaching the Top position will be achieved in next 3 years..
Congrats. G8 achievement without any major advertisement. Just word of mouth made u r to this level. This shows your strength n approach to lower rang. Keep it up Mr Nitin n all the very best. Hearty congratulations to all team members of Zerodha. Good going keep it up. When we can buy Zerodha stock from NSE ???? Hearty congratulations to all team members of Zerodha. Good going keep it up. Maintenance of good service is very important. Congratulations… Surely it will No 1..In coming day’s.Zerodha has given opportunity to retail traders to participate in equity..
Ur hard work and visions now .. paying u.
I had suffered accident and was bed ridden..Due to only zerodha..I was able to earn some amount to serve my daily needs. Impressive, Congratulations! Sure Zerodha may become number 1 soon. But for every business, the big question is……….how to stay there? Zerodha should have a “Think Tank” only to address this…..
And even the Think Tank should be ‘refreshed’ every year/even 6Monthly. Tremendous achievement. I have personally shifted from ICICI to Zerodha and enjoying the trading. I wish Zerodha to achieve continuous growth. I am very happy after opening Demat account with Zerodha. Congratulations… Surely it will first In coming day’s.Zerodha has given opportunity to retail traders to participate in equity..
Congratulations, hope you reach number 1 soon. All the best? Congratulations to ‘ZERODHA’. As a member of Zerodha, I hope Zerodha will be at the top soon. Will keep supporting through new suggestions and by demanding new features. And also hoping to get an excellent customer service and frequent bug fixes(if any) from your team. Congratulations. Hope Zerodha will be no 1 shortly. Dear Nithin! You’ve shown it to the world that Simplicity is most powerful than any Empire. The unique model you’ve created in this area is the sustainable growth. Other giants in broking are struggling to understand how a company can sustain with almost no brokerage! In fact, the taxes are more than the brokerage with Zerodha! Hats off to you! These giants thought that the discount brokerage firms will collapse on their own and cannot sustain. But you’ve marvelled the path for yourself with phenominal use of technology and creative business model to bring in win-win situation for your clients – investors/traders and the business itself. Though I’m just having association of 3 months, I really see the personal painstaking efforts in each of the client interface you have developed/created. I haven’t seen such robust systems even with these giant brokerage hungry companies. You have crossed Sharekhan and that actually makes you No.1 because HDFC and ICICI has a very wide PAN India exposure and access to largest customer base through variety of financial businesses – mainly through banking. Best wishes to you and Zerodha team. First I congrats to zerodha and all team members. I think this is the best achievement for the company and all dear members and we need to me the first of all… That can be the biggest challenge…. And mainly the CEO responds to our queries. Congrats to Mr. Nitin & entire Zerodha team. Always liked homegrown Indian technology. Proud to be an user of Zerodha. This is my 1st trding a/c. I am happy with software, app & support. Hope, continous technical upgradation will be adopted. Love to see Zerodha as No. 1. Yes, I agree, You are No 1 “Trading Only” Broker in the country (ICICI and HDFC are banks, and ICICI just listed ICICI Securities). We’ve consciously stayed away from the advisory space as there is no way for anyone to accurately predict the markets. If someone did know, they’d trade the markets rather than tell people what trades to take. Other services with time. ? Good work guys. The platform has really evolved beautifully in the 4 years I’ve been on it. Congrats to Nithin and entire team of Zerodha, who had contributed for this success. I am happy to be the customer of Zerodha and I am satisfied with what I was expecting in late 2008. Thanks for all your service to the investor circle. Awaiting swp stp switch facility in coin platform. Hey Raghavendra, we are working on this. We’ll keep you posted. I want to add a comment as a recommendation to Zerodha. Please increase the intraday margin for other stocks as well in NSE and this will be helpful for the investors similar like MNCL. But the services u provide for mobile no changeover at kite application..why u charge for this. I personally love zerodah in trading, it is convenient and smooth in software, I thank the team for making zerodah best place for trading. Oh great!! Congratulations!! But your platform still does not take gtc orders. You have incorporated smallcase and other services.. but you need to place a stop loss or a take profit every day.. it’s an amazing platform if you do intraday but for positional trading I find it annoying and specially since I manage few accounts apart from mine.. and I brought them on to zerodha. And please zerodha team don’t give me an answer saying this is not provided by the exchange.. I bet the indicators you provide us is not provided by the exchange and you developed a solution. Be the solution provider we need. Concentrate on it.. that’s what made you 3rd largest.. now you bring all these other services so you can make money while the platform has just been the same.. putting makeup on an ugly woman will not get her the ms world title.. you should be really wondering why ain’t you sitting at number one instead of being happy about being the 3rd..
Hey Harish, I’d to think that Zerodha is a pretty woman. GTC/GTD orders are complex because of we essentially have to maintain a layer to store these orders. Having said that we are working on them. I still remember when I opened my account last year & when I spoke to Hannan Delvi in 2013 to come on board and join your mission, still nascent and getting bootstrapped. This is testament how good product platform speaks for itself and how the power of varsity is coming into play for clients. And Zerodha hasn’t spent a single penny on marketing. Power of WoM. Go figure. And to challenge behemoths like HDFC, ICICI. More power to you guys. Hats off. I’m sure a lot of disruption is due in thr next decade once blockchain technologies enter the industry but you guys are nothing short of a wonder story. Cheers. Everything is going great except some of the things that are still not there to the mark like sudden technical glitches which happens every now and then. Apart from that notification for order placement or completion should be added which is still missing and price alert long ago. Please work on these things. Apart from these things everything is great. Congrats to the Zerodha team, particularly The founders of the team, The brain leading the team Mr. Nithin kamath. Sir, I come from town area, zerodha’s brokerage giving me freedom to earn small amount regularly. I hope zerodha will provide tips and company’s research paper for small investors. I hope that zerodha will reach in 1st position in India in broker house. Keep it up, this is just the start and many more milestones are yet to be covered. A ton of Thanks for providing a nice & user-friendly platform to invest & trade to ordinary people like me. May God keep on showering his blessings on a phenomenon called Zerodha. Proud to be part of a real n innovative Indian startup.. onwards n upwards! Heartiest Congratulations !! Great going Nithin and Team Zerodha. Big news. Congratulations Team Zerodha..
Congratulations………. Zerodha Team. And Great Team Work. Keep Going..
Congratulation to all Zerodha Team, Want to see you at top. Congrats to all the Zerodha team members…..
Congratulations to Nithin and team Zerodha. Small cap became mid cap & now it’s time to be large cap in the near future. Whenever we are busy searching for graphs, the site get hung. May due to the heavy traffic during 9.15 AM to 10AM. We need something to be done to overcome this. Many many congratulations to ZERODHA Group. Hey Rajesh, all of the educate sessions are available in English. Head over to our YouTube channel https://www.youtube.com/user/zerodhaonline to check them out. I would like to share you my opinion about reaching the new customer. When the public interested ( even not interested )about the market, banking securities easily catching the client and pushing into the market, not explaining the charges and services. Why zerodha is not approaching directly. You are giving best service, before knowing your service we struggled with 2 to 3 brokers and get the bad experience and quit the trading & Investment. It’s eating the time and losing the hope about the market. Also once we found you and taste your service, not able refer others orally. Please make the advertisement video from your side and upload in youtube. It will easy to found you the beginners and refer to others. Because I belong from rural I had struggled 2 years before found you. I expect what you feel about that. Great going team. I am confident that next year Zerodha will be on first position. Provided trading platform, ultimate products like Coin, SmallCase, Screener etc. and the way they spread knowledge is really appreciate users like me. Thanks team. All the very best for the future. Many congratulations to each and everyone working at Zerodha!! Congratulations to the whole team on this achievement, and best wishes for your further growth. I find the Kite platform very user friendly and innovative. Charts are fantastic as well. Hopefully the new Q will be worth the wait. congratulation to get 3 rd place in stock broking in india. I will small suggestion for U eldelwess broker clients only 1.05 lakhs,its provide reasearch and give tips given cilients. we wait & hope 10 lakhs cilients for next 2018-19 year our broking zerodha. There is no way for anyone to accurately predict the markets. If someone did know, they’d trade the markets rather than tell people what trades to take. ? That’s why we’ve consciously stayed away from the advisory space. Hearty congratulations. It has been a pleasure trading with you. From the registration process to trading, it has been very simple and easy. Congrats nithin and team, varsity has helped a lot . Congrats team Zerodha. Great going. Congrats team Zerodha. Great going and keep it up. Excellent achievement. Your technology and API support are superb. I am a starter and your Kite mobile Application and the chart facility helping me to study the market and to learn from the mistakes and losses. Thanks for the utilities and low brokerage. I hold A/C with Zerodha since 2013. The Kite platform is fabulous, simple & very easy to use. Because of this i have continued to remain as an active user. Please don’t add any extra feature as suggested by few clients as it will make it complex; instead I will suggest to have an another app for all other services provided by Zerodha. There are few Pros & Cons with Zerodha too but this is not the post to highlight them. Finally I will say Congrats to all of us (clients) as we only make this come a reality. Congrats to Team Zerodha.???.???. Mighty congratulations Zerodha. Keep the flag flying. Sooper seh Piper! It indeed a matter of pride to be amongst the top 3 rankings in terms of active clients ! Congratualtions on the feat . But can you help me the stats that shows the top brokers by turnovers in cash , equity derviative and currency derivative segment ??? Hi Kamat, congratulations. Is there any plans for franchisee. We can also grow by expansion of business ..
My hearty wishes Nithin and all Zerodha people. May God bless you to reach higher and higher. It’s an amazing achievement in such a short duration of time!! Congratulations. I really wish you guys bring the leverage system in delivery which would be really amazing for traders like me who opt for positional trading ? Many Congratulations to Zerodha Team. Zerodha trading is very easy to use. Congrats team Zerodha! Genuinely happy to about your success story.. wish you more and more success with every passing year! 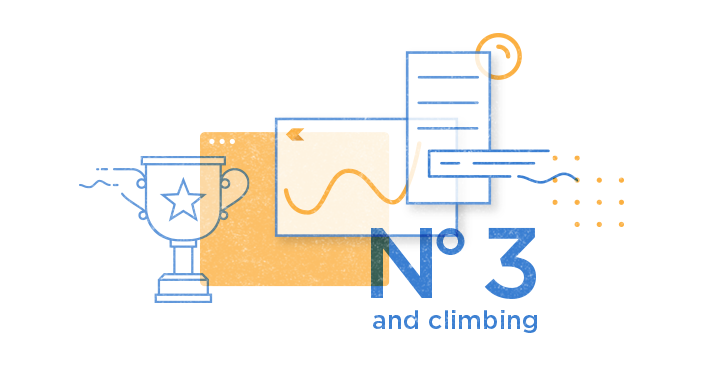 Congrats…Team Zerodha…May you climb the top in coming years. Congrats team Zerodha. Great good going and keep it up? and keep us grow☺️. Love me zerodha treding I like it zerodha. I wish that your company come on no.1. Best luck sir. Wonder to accept. Genius with almost no brokarage on delivery and very low brokarage maintaing such a healthy honest businesses house. Congratulations may be least , something more deserving for the intelligence to establish this huge. Best wishes for the coming days and years. Congratulations Team ZERODHA and wish you all the bests. Hope very soon we will be at the top. Please list Zerodha on exchanges so that we can also be benefited by being part of Zerodha story. Wow, In above list none of them are discount brokers except zerodha. Lot more need to be done in the industry to create more awareness..
Congratulations, You need to improve so many things. Congrats esp to Nitin who conceptualized the idea of the business model & the whole team without which it would not have reached such a height in such a short period.Having 4-5 a/cs since 3 years now,we experience development of laxity in solving our non-routine querries.Since last more than one year,we have been requesting to provide contract notes with scripwise/trade wise levies,but not complied with.Actually you are supposed to do it if client requests for it & such mention is made by all the brokers in their contract notes mandatorily.We have experience of HDFC SECURITIES immediately complying to the client’s such request even accepting such a request as a standing instruction.But Zerodha has failed to do so despite our repeated approach & has failed to give a satisfactory reply.SO USING THIS PLATFORM TO GET A SATISFACTORY RESOLUTION. Hey Atul, we are moving our backoffice to a new in-house platform. We should have tradewise contract notes available in the next couple of months. Congratulations to Zerodha Team.Best of luck. Awesome !! I was wondering when this would happen. Afterall with all the unique, productive and reliable platforms that Zerodha has made available to the retailers in the last few years its no Surprise that Zerodha is #3 broker in India. Soon to be #1 i presume. Who knows. With the amazing progress that Zerodha has made in such a little time attaining #1 Broker in India shouldn’t be a big deal from here. Anyways its really nice to see this. Congratulations to the whole Zerodha team. May you continue to do the good work. Congrats to all members of Zerodha… I am very happy to join in Zerodha. I always think as a member of Zerodha family. I am always try to give advice to my friends and family members to D-mat account open in Zerodha. But I have compiled to you..please available more contact numbers which will close our relationship to you. And another one is when I am giving a reference to you, please try to call immediately and try to help them to open account. Otherwise they thought you could not give best service as other companies always try to communicate with them. Ok congratulations again for you no no..our success. Congrats Team Zerodha and Best of Luck to achieve more feats. I expect Zerodha in the first place within two years. Wish you all the best. congrats team zarodha. I have a request that plz give sl orders in BO & CO . Some brokers smaller than our Zarodha already given the facility. Congrats…team Zerodha… Wish u best of luck.. god bless. But I think Zerodha need to streamline operation issues and to train the staff. In my case at the of account opening, I got mail that I need to submit KYC form to update my address. I called my executive Mr. Arjun Majunath and I asked him whether the photo is needed on KYC form or not as they just need to my address. He replied that photo is not needed on KYC form and even I had sent soft copy of KYC before the couriering it. They have not raised any objection to a soft copy too. Now they are saying My form is kept on hold as a photo is not pasted on KYC form. Congratulations Zerodha team !!! Keep it up. Zerodha is really a boon for small investors as well as traders. My previous congratulatory message appear to have got lost somewhere. I wish to congratulate and at the same time request you to improve support activity. I have changed my account from HDFCSEC to Zerodha, two years ago and am happy about the kite platform. However, response from the support team, some times, I find irrelevant and confusing. I am yet to receive correction and clarification regarding excess debit done in the ledger ( more than a week ago). Twice payout was done in the ledger whereas credit to my account was done only once on 3rd april 2018. I am unable to understand why such issues are not taken up on priority and sorted out as the balance is the major issue for an account holder. can you please give us the same day trading facility like future plus and option plus of icicidirect where we can short sell options with very little margin which is very useful on expiry days, thank you. Gr8 going 🙂 Congrats ………..
Credit goes to all Zerodha team. Gr8 apps in market terms. Thanks for providing best tools. Keep it up. 1. It is a grrr8 achievement indeed but not surprising. I trust Zerodha will be number 2 in 2018 and Numero Uno by 2020. Wish Zerodha Team all the very best. 2. ICICIDIRECT is biggest looter that, of late, investors have realized and they are running away from the clutches of ICICIDIRECT. It is therefore surprising that how there can be such a steep growth in number of customers of ICICIDIRECT as shown for latest year in the table that hardly can be believed. ..Something is wrong in the data. Good to see the achievement by Zerodha team. One can go with Zerodha for investment but when it comes to trading still lot of improvements required…. Happy to see the achievements of Zerodha! My hearty congratulations to Team Zerodha! (i) Can I trade on these scripts just like a equity cash. (iii) Is there any lot size for buying & Selling. 2) The same brokerage as equity. 3) ETF is just like a mutual fund listed on an exchange. Sorry sir, I have another query . Can you inform me what are the advantages of buying ETF on Zerodha platform than directly buying ETF from its issuing company’s website as for example buying ICICInifty from ICICI website. A big congratulation to All the Zerodha’s Employees and the CEO for there effort to take the company to that place. I’m trading with you people from last 2 years,, as per the brokerage i’m satisfied and but when its come to the issue’s which we face during the market hours its really hurts more than anything else. The latest on 12th April 2018 the technical issue which occurred its just shrink the mind. I takes lots of time to build the trust and to make a good trusted company but i doesn’t take a seconds to take away all this from the hands. I hope this message is clear. I have seen lots of times technical issue arise, all i want to request you please have a look onto this technical issue or else i’m totally satisfied with your product and your hardwork. Congrats Zerodha, Nithin & Karthik! Congrats Team Zerodha, I am associated with you from 2010 (DS0518) and very happy with your service which is day by day is increasing. 1) please provide IPO purchasing power..
2) During Instant money transfer from bank to zerodha should be free at present it is chargeable..
God bless to all team ZERODHA…. Congrats guys, But just curious as being climbing miles I see you that leaving your old values behind. Most of your blogs / tutorials are outdated…. no site upgrades? no blog upgrades? Love to see you world class broker with world class technologies, charts, studies, software, sites and services and far ahead then no 1 position in India. Soon. Can you be specific? I find the software/charts also much superior than BIG brokers. I am not denying that Zerodha software doesn’t have good features, My point is that to be world class still Indian brokers needs to have updated features like Interactive Broker has. Zerodha needs to improve on its desktop software to be ahead in competition what we have on kite is not there on PI and it needs to be improvise for intraday trading or scalping. Zerodha got larger client base because first of all it is discount broker and less brokerage and few advanced features but to be no 1 it needs to improvise a lot on software features to be world class and customer care. (I am basically practicing intraday trading and hence have comparison on that basis.) Now a days many sites/brokers are coming with similar features and Zerodha needs be much ahead from them to be top in competition. also it should consider its services and compare themselves from world rather only in India. Though I congratulate them to gaining their position. few points if you like to consider . 1, Customer care not support when we need it most. Like I lost my most of the capital on a trade where in BO order only Buy order executed and sell and SL orders cancelled because Zerodha’s lease line connection was dropped with exchange(what has been told to me by Zerodha support). After placing order it all freezes and when I saw issue, I tried 2 hrs to connect to Zerodha customer care with no success and then finally was not able to square off my position by myself but was done by Zerodha risk management team. 2. As I said Pi Software is lacking features in terms of kite. I know people moving on cloud but practically we need to have fast analysis of our position, stock scanning, fast entering of orders (with shortcut keys of course). Latest indicators etc. 3. Kite has advanced features but not that easy and fast to trade and to see charts. 4. combining everything on a portal rather different sites would be a much easier for user point of view. 5. Zerodha mention that they want to educate traders so expecting updates related to education on different plateform like intraday, scalping, technical analysis for short term trading etc more frequently then what they have right now. But I should mention that Zerodha has one of best reporting for P&L, TAX, positions and light weight software. I don’t know if I am contradicting myself and how Zerodha will make its software light but powerful. No1 position holder is charging much higher brokerage but actually what I personally feel that people trust on its services so far….. I know I am not explaining in better way but I hope all experienced trader and even Zerodha should be able to get the point I am trying to make. Congrats Nithin and Zerodha team. Keep it up. Hoping to see u at first soon. Many congratulations to the Zerodha team. Unfortunately though the 3rd largest stock broker still does not provide ‘Good Till Cancelled’ (GTC) order feature. What a bummer! Another area where Zerodha’s low cost model can make a huge impact would be to launch Index Funds & ETFs similar to what Vanguard did in US. This will surely elevate Mr. Nithin Kamath’s stature to that of Jeff Bogle who even Warren Buffett claims have done more for American investor than anyone else! Team Zerodha, Your work reflects excellence and you think simply like a trader…… that is the reason your customisation has so many followers…. Keep the great work. I must say I recognized this much before this day. I joined in 2011. I have tried other platform they sucked and charged high, I researched for some good platform, I am proud of my research. I recognize this company in the streaks of (Jio, Xiaomi, Tesla, AAP) i.e. breaking a corporate nexus, a long running trend, where nobody would choose to stride due to fear of failure. I must say ICICI and HDFC securities are nothing in front of you. Actually you are already ahead of them, since majority of their client base is converted from existing bank accounts user base. Some key points I would like to bring where zerodha has been awesome. 3. No marketing, no useless calls, research reports etc., a Relationship manager sitting on my head telling me how and what to do. Some things you definitely need to improve or can provide to become Indias unbeatable. 4. Glitches, margin reduction etc. during high volumes, volatility. Congratulations to Team Zerodha. Please keep innovating to make it much more pleasant and profitable to use your services. A lot of money must have been paid by me all these 12 years towards brokerage charges and i checked my trade charges in zerodha twice. I was unbelievable to see the paltry amount i had paid in zerodha. Besides, transfer of amount to your a/c is easy. However, i would suggest you to start a small case for contrarian investors who are many. The varsity is really wonderful. Congratulations Zerodha, keep on the good work. Congratulation Nithin & entire Zerodha team for achieving this milestone in such a short time period . You are providing a value platform to lot of retail investors . You people are really working nicely, very helpful & instance support. Thank you once again for giving such very good user-friendly portal. All the best for great future ahead. Congratulations !!! Keep up the good work and always stay ahead. I must admit here that yours’ is the best trading platform I’ve used so far. Please provide the proper support to the customers. I have raised ticket with support but without proper solution they closed the ticket(#20180418982857). And when we tried to contact customer care also worst experience we revived . There is no option to update the comments in support link. Try to increase the Quality support. 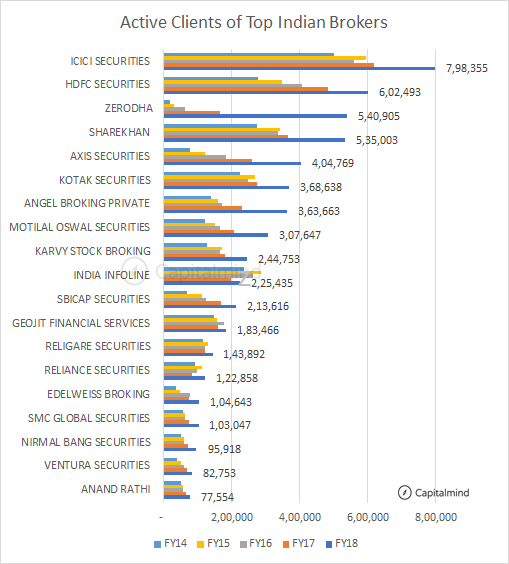 I am happy knowing that Zerodha is in No:3 among top Brokers of India. I wish you to be a No:1, top most in India within one year. Please continue to help small investor, so definitely, Zerodha will No:1 in India in Short time. Unable to login even to Kite. Is PI working? I have not installed it. Hey Pradeep we’re working on this. You should be able to log into Pi to trade. Download it here. PI is also often logged out. So can’t trade with confidence on Pi either.. Kite should be up ASAP. zerodha gained 3.5lakh customers in last year? Congratulations for this incredible feat!!. I just have a request for an additional feature in kite charts. I feel many traders rely on candlesticks. This being the case, if kite can display a 3-interval snapshot of candlesticks for all the stocks present in one market watch (say, 20 stocks) as an array of charts (arranged in rows and columns), it will be be very useful to quickly identify buy/sell opportunities in intraday trade from among all those stocks. What i’m asking for is display of only 3 candle sticks per stock, namely current time interval, previous one and the one previous to that. These three will help us identify an opportunity. If a stock looks promising then by clicking that “3-interval chart” should display the complete chart for that stock as a pop-up, to make ourselves doubly sure that the opportunity for buy / sell is really there at that point of time. Currently, we have to click each and every stock one by one to look for that opportunity, which is very cumbersome. Would you please consider this feature for your next version of kite?. Congratulations for this incredible achievement within a short span of 8 years. Trading not yet started, following the learning process. But, sorry to say, I deeply regret for choosing Zerodha Demat account. Nothing happens on time. I can say this as worst service. Today I tried adding money by using UPI mode, but it shows it will take 3-5 business days to deposit. Because of this delay my portfolio share prices increased. I lost trust on zerodha, If this is the case, then how can I have trust on you (Zerodha) ?? What you people are trying to do by achieving 3rd position??? Now my question is, who will compensate my loss and who will get back my trust on you??? I think I may not get any solution for this, because zerodha is in No. 3 position, so the management doesn’t have time to look into this matter. There r many brokerage houses in India. Among them Zerodha is undoubtedly low cost broker house . But it has so many drawbacks. Zerodha needs to upgrade its apllication with sectorwise stocks , top gainers – loosers . In this respect application of Sharekhan is much better . Zerodha needs upgradation . This contract note (12-5-2018) does not contain the details of the share transaction. I am observing lot of such issues with your platform and reporting. Also the report name is simply “Contract”. It does not have user ID, Date and .pdf extension. So every time I receive the report I have to manually change it (.pdf) myself to view the report. I have opened several cases but it was of no use. If this continues you will loose customers. I am not able to see/select Commodity to transfer funds at Segment level. Please activate drop down list and applied same.Sent may time to emails to customer care but not activated. Hi Koteswara, you haven’t e-signed your commodity account opening forms for us to process yet. Please log into signup.zerodha.com and complete the e-sign to proceed. e-signed has been completed for commodity, please check and confirm when i can see the option. If your friend has a demat account with us, he/she can fill this form to dematerialise the shares. I want to activate EQ to my trading account.As of now active products are F&O and Commodities. Please let me know the the process to activate Stocks also. Can you please start VTC ordering on zerodha. This is a facility with ICICIDIRECT where I put an exit position on my current order and it is valid for next 45 days. Hence I do not have to place a new order everyday. In kite, we can scroll the charts by pressing the mouse button and dragging the mouse. For right side scrolling you have provided an arrow button on the right side. But for scrolling to the left side of the chart, there is no arrow button. Please provide an arrow button for left side scrolling also as it is difficult to keep pressing the mouse and drag it for long (especially if we are studying many charts over different days). Could you please provide a software tool for detecting some specific candle stick patterns on charts which denote that the price could reverse.? The software should give an alert to the user when it happens. I don’t mind paying for it as subscription. Please also implement trading directly from charts in kite. This will save the time required to key in the price. You need improve watch list and kite Mobile Quelity and add more watch list and Last Trade Price and Volume. In response first I was told to change my browser. When the support team called me I explained to them that the browser could not be the problem since the rates don’t show up even on the mobile app. I was then told that pre opening session prices have never ever been shown in the market watch. This is not possible because ever since February 2018 my trading decisions have also depended on the pre opening session prices updated in market watch at 9.00 a.m. Now I have to depend on other sites to give me this rate. Is Zerodha as customer-centric and responsive as it was in its early days? Say around 2015? I would like to think so, I certainly hope so, but I am getting the wrong vibes. I started learning trading back then and after extensive research, locked in on Zerodha. I had to stop trading shortly afterwards to address some of “life’s responsibilities”. Now I am finally free to start again, and so I tried accessing my account, which – and no surprises here – doesn’t work. Likely dormant. Raised a ticket for assistance (#20180816374657), followed up, but no response. Now this was unexpected – very unlike the Zerodha I knew. The price of scaling up, maybe … ?! Guess I need to visit their offices to sort it out. Congratulations Zerodha Team. I have recommended Zerodha for all our family andfriends. I am immensely benefited from Zerodha . Thank you, God bless you all and wishing all best in your future plans. Congratulations zarodha entire team !!! It is good to see Zerodha in third place but to be honest your account opening is very poor, your firm is not able to trace form received from a courier. I have sent 3 forms in one courier but and received at your office on 08-10-2018 till now I have received update only for two accounts and for a third account they are not able to even replying me on phone. There has been a rejection on the forms and the same has been communicated to you over email on 11th, please check the same, our sales person will be reaching out to you in a while. Guys, have one proper customer care number with proper method, 4 digits in a/c id & zpin is mandatory but it is always not working in that combination, we are not able to talk to you without that combination???? why can’t you guys have one option even that combination is not working ?? ?